I want to create 2 Dynmic graph: one for download and the the ora for upload. 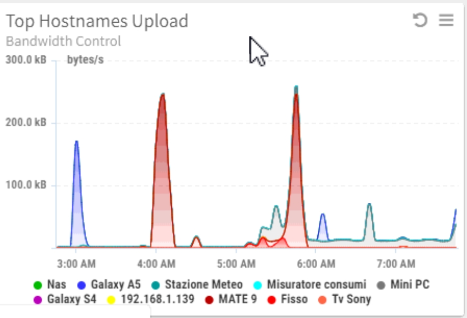 The default "net usage graph" shows the total band usage, but i want to separate the 2 traffics! What I want to obtain is which device is using incoming and outcoming band. Are you using the Bandwidth Manager app? If so there are pie chart reports there that will show you "Top clients (by sent bytes)" and "Top Clients (by received bytes)"
Thank's you for repliyng but it's not what I asked for. I'm not interested in trasfered data ammount, but at the transfer speed! Last edited by peg1987; 04-03-2018 at 02:59 AM. A dynamic graph has a "dynamic" number of series that are computed automatically. like "Top Applications Usage" where it shows the top X applications on a line chart. It sounds like you want rx and tx which is static, which would just be a regular line chart. Maybe you can just show us what you want with excel or paint and we can try to create it? Dynamic because I want to know the upload and download bandiwidth in a precise moment (now for example) for each usaer. The measurement unit is KB/s-MB/s. Later I'll post you a screenshot. Anyway it should be a fork of the "net usage graph" splitted upload and download and top 10 host in x axis. Last edited by peg1987; 04-08-2018 at 10:22 PM. This is only for upload. I want to do the same for Download. The graph you suggested it the sum of the dowload and upload and is not that i need! Just create the same graph but only show c2s_data instead of both. If you don't believe the data you see, you'll need to investigate why. We can't see your data nor your network configuration. It could be that you are blocking data. It could be that you actually have port forwards or upnp in play and c2s is actually download for an inbound session. It could be buffers at play. It could literally be tons of reasons. Thats why reports logs everything, so you can go look at the individual session that you don't believe and see exactly what happened. Many many people have claimed that the reports is improperly summing numbers. I can assure you postgres is properly adding numbers. It adds the numbers and only the numbers you tell it to.